United States golfer Bryson Dechambeau walks off the 18th green during the Ryder Cup Sunday singles matches at Le Golf National in Paris. A late eagle putt carried Bryson DeChambeau to victory in Las Vegas. 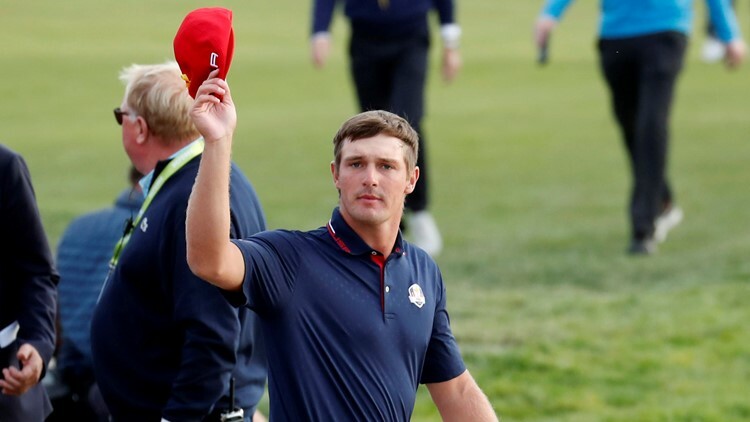 LAS VEGAS (AP) - Bryson DeChambeau holed an eagle putt from just inside 60 feet on the 16th hole that carried him to a 5-under 66 and a one-shot victory over Patrick Cantlay in the Shriners Hospital for Children Open on Sunday. He had to survive a wild back nine at the TPC Summerlin in which four players had a share of the lead at some point. Cantlay had a one-shot lead until flubbing a bunker shot on the par-3 17th to make bogey. One hole behind the defending champion, DeChambeau made his eagle putt to take the lead.